Getting a startup off the ground takes more than a great idea; you also need money. Too many new businesses fail due to lack of initial capital. Unfortunately, Startups usually don’t qualify for traditional loans from banks, so aspiring entrepreneurs need to get creative when seeking investors. Businesses that offer peer-to-peer, or P2P, loans have traditionally focused on individuals who want short-term personal loans to pay off their credit cards and consolidate their debt. Many P2P lenders now provide loans for business purposes, but most require borrowers to have a stellar credit rating above 650. Since these are still technically personal loans, the borrower assumes all liability. In others words, if your business fails and you can’t repay the loan, your credit rating can suffer. Similar to credit cards, interest rates can vary greatly depending on the length of the loan and your credit; however, you immediately start paying interest on the entire amount since you receive a lump sum. you should investigate your state’s bankruptcy laws and make sure you understand the risks you are taking. Although drawing on your retirement early is rarely advised, you can actually use the money you’ve been stashing away without incurring penalties or taxes if you invest those funds into a business. 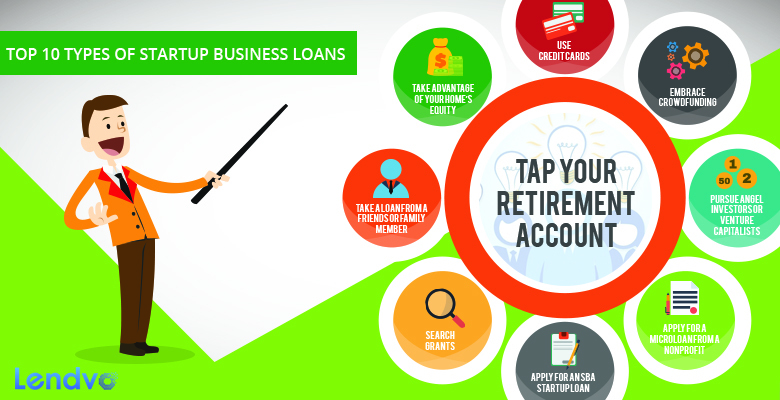 Starting a business is an investment in your future, so it makes perfect sense to use your retirement account to generate more money for when you’re finally ready to retire. This process is called Rollover for Business Startups, or ROBS, and it basically lets you use your 401K or IRA to buy stock. To take advantage of this option, your business must be established as a “C” corporation. Once you become successful and start paying shareholders, a portion of the profits will go directly to your retirement account. Hundreds of individuals, businesses and nonprofits have funded their dreams through raising money online. Crowdfunding websites let anyone create a campaign to solicit donations from friends, family and strangers to fund their project. Rather than repaying donors directly, solicitors are encouraged to offer incentives and gifts; for example, you could give away t-shirts, stickers, coupons or just special recognition to your investors. business in exchange for partial ownership. Angel investors and venture capitalists are wealthy individuals who offer large sums of money to businesses with the expectation of a high rate of return. Most venture capitalists work through firms that help them choose lucrative investments, while most angel investors act independently. The biggest benefit to either option is that the funds are debt-free; however, angel investors and VCs expect some degree of control over the business, so it’s important to be clear over the terms of your agreement from the beginning. They also expect a thorough business plan including financial projections upfront to convince them that you can be successful. Since venture capitalists are most concerned with making as much money as possible, they tend to go after businesses that can garuntee returns of 10-15 times greater than their initial investment within 5 years. Most startups can not promise a high rate of return, so a VC may not be the best option. On the other hand, angel investors are known to seek out startups. They may be more flexible than a VC, but they also expect some say in business operations as a means of protecting their investment. The best way to find an angel investor is to do as much networking as you can. You may know someone with connections to a wealthy individual in your area who would be excited about investing in a local business. There are also websites where you can advertise your business ideas to solicit angel investors from around the country. Once you find a compatible investor, be sure to structure the loan as a convertible note. This way, there are fewer legal fees involved than in normal equity investments, and you don’t have to determine the value of your company upfront because it will be based on the valuation of the next investment. Some nonprofit organizations offer microloans to aspiring entrepreneurs. Even if your finances and your credit history aren’t stellar, you may still qualify for reasonable terms and interest rates, which will allow you to improve your credit as your businesses grows and you repay the loan. Microlenders and other nonprofit lenders often cater to business owners who are part of a minority or historically-disadvantaged group. They also usually target businesses in communities with struggling local economies. As the name implies, microloans do not provide large sums of money, so borrows may need to find additional funding. If your business will provide significant value to your community, you may qualify for a microloan up to $50,000 from the U.S. Small Business Administration. The Community Advantage Program specially caters to underserved populations by offering loans up to $250,000 for startups. Funds from these programs do not come from banks; instead, they come from SBA-approved intermediaries like CDCs or non-profit organizations. You generally need a credit score well over 650 to qualify for an SBA loan. When approaching the SBA, you need to have a carefully constructed business plan including you financial projections. You should also have at least 30 percent of your own money invested in the businesses because it shows that you are committed to making a profit. The SBA also generally expects borrowers to have some management and industry experience. If you can meet these requirements, you may be rewarded with a very low interest rate. There are hundreds of private foundations and government programs that provide grants to startups. While competition for grant money is very stiff, the money comes with few strings attached, so putting in the effort can pay off big time. Grants usually target specific specific demographics; for example, former members of the U.S. Armed Forces may apply for business grants exclusively reserved for veterans. There are also special grants for women, racial minorities and individuals from other traditionally disadvantaged groups who want to start businesses. If you have any friends or family members sitting on a lot of cash, you can go about funding your business the old fashioned way by borrowing from someone you know. You don’t neccessarily need perfect credit, but if your relative or friend has doubts about your ability to pay them back, they will be reluctant to invest in your business. While taking a loan from someone you have a good relationship with has many benefits, it also comes with unique risks since the investment is both financial and personal. Be very upfront about your ideas and abilities when soliciting from loved ones, and make sure they clearly comprehend your plan. Like any professional agreement, you should put the terms of the loan in writing to avoid any conflicts down the road. You should approach perspective lenders with a business plan that includes financial projections just as if you were pitching your idea to a professional investor. a loan for a couple of reasons. Most obviously, if your lender is a shareholder, they will expect to have a say in business operations. Even if they only own a small portion of the business, they may feel entitled to tell you how to run your company. New entrepreneurs also have a tendency to overestimate the value of their business, which can lead your lender to fee duped if they don’t see high returns. Agreeing on clearly defined loan terms is usually the fairest option. Credit cards are an extremely common tool for aspiring business owners. Unfortunately, credit cards are not the greatest option for borrowing money to start a business because they are more expensive than loans. Companies base their annual percentage rates on the cardholder’s personal credit score. If you have poor credit, you may only qualify for secured credit cards, which can carry high fees. While over a quarter of business owners rely on credit cards for capital, businesses that depend on them too much often fail in the long run. Some credit card companies have special promotions that let you borrow at zero percent interest. They also may offer cashback or other rewards when you charge purchases. If you’re lucky, you can earn a few hundred dollars just by charging a certain amount within a few months of signing up for the card. Using your charge card responsibly is one of the best ways to build credit for a small business, which will allow you to borrow from other sources at lower interest rates later on. Credit cards may also be useful for consolidating debt.